Plot: Katniss destroys the game arena and finds herself in District 13 after District 12 is completely destroyed. There, she meets President Coin who convinces her to be the symbol of rebellion and Katniss agrees but on condition that Peeta and other victors held captive by the Capitol are saved. PICKING up where Catching Fire, part two of The Hunger Games trilogy, left off, Mockingjay — Part 1 starts off with Katniss (Lawrence) throwing a fit at mentor Haymitch (Harrelson) for failing to keep his promise to save Peeta (Hutcherson). She is also upset with Plutarch (Hoffman) and Finnick (Claflin) for the same reason. However, she seems to find some solace when she realises that Gale (Hemsworth) is not only alive but also managed to save her mother and sister, Prim. Much later, we find that Gale had also saved 10% of the residents in District 12 before it was ruined by the Capitol. District 12 residents now live under the militant leadership of District 13’s President Coin (Moore). When Katniss is physically and mentally able to listen to reason, Plutarch takes her to meet Coin. Here, Katniss is asked to be the poster girl for the rebellion against the Capitol, which inevitably means bringing down the reign of President Snow (Sutherland) who has ruled the Capitol for a long time. At first, Katniss is opposed to the idea because she fears losing more people she loves, but after visiting District 12 and a bombing incident in District 8 while visiting a hospital, Katniss, spontaneously goes into war mode and declares war against Snow and his administration. Her conditions for leading the rebellion are that Peeta and the other victors that survived the 3rd Quarter Quell are rescued, and pardoned at the earliest opportunity. Coin agrees to the conditions and the propaganda to encourage rebellion in the district to be carried out. And in line with the “for every action, there is a reaction” saying, for every act of rebellion by District 13, the Capitol retaliates by sending Peacemakers to “restore order” thereby killing those who were part of the rebellion. To keep the rebellion from escalating, Snow’s administration tortures Peeta and brainwashes him to demotivate Katniss and the districts from rebelling against the Capitol. A very haggard Peeta is interviewed by Caesar Flickerman (Tucci), the Games’ former presenter and the interview is broadcasted to all the districts. Katniss is disturbed by what Peeta says in these interviews but still vows to save him. But, during one of the broadcast sessions, Peeta warns Katniss about an impending attack in District 13. His warning provides District 13 residents an additional eight minutes — enough time to execute their mass underground evacuation plan. Everyone manages to get inside safely, and the facility survives the attack unharmed because District 13 had trained its residents since the Capitol first destroyed it. In light of the added time, Coin keeps her promise and sends a rescue mission to save Peeta and the rest who are held captive at the Capitol. The rescue mission is successful but, as always, there is a catch. The third instalment of the franchise shows maturity in that there is a clear progression in the growth of all the characters and the plot in itself. The characters convey relatable emotions as they prepare for a full-blown war. 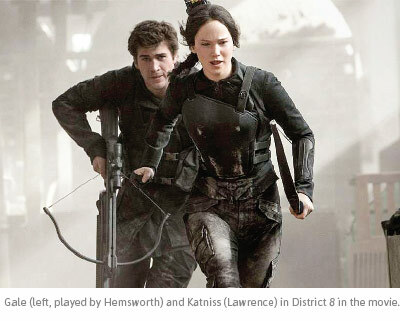 The audience can expect to see some new faces but not so much physical action as this movie focuses on Katniss gathering herself in all aspects — physically, mentally, emotionally — to go up against Snow in the final instalment. If you’ve not watched previously The Hunger Games instalments, it would be wise to watch them first to better understand the concept and underlying message of the franchise. Mockingjay — Part 2 is set to be released in November next year.